Sentinel Marine has marked a milestone occasion with the launch of the last in its latest fleet of new emergency response and rescue vessels (ERRVs). 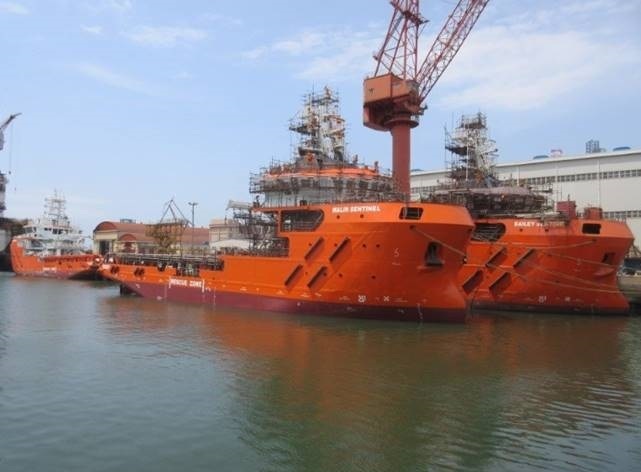 Malin Sentinel – SK99(N535) – has been launched at a shipyard in Cosco and is currently berthed alongside one of the firm’s other vessels, Bailey Sentinel. She is the ninth new build to be commissioned by Sentinel Marine since 2015. She will undergo sea trials during August and is expected to come into operation by early 2018. Malin Sentinel will cement the firm’s position of operating the youngest fleet of ERRVs in the North Sea. Many other such vessels have been repurposed from former uses as fishing or supply boats. However, the new purpose-built multi-role vessels by Sentinel Marine ensure clients have access to an efficient fleet equipped with the latest technology. Sentinel Marine has just taken delivery of Mariner Sentinel, which will be operate in the North Sea on behalf of a major producer. The vessel will be christened later this summer. Malin Sentinel is launched into the water at the ship yard in Cosco. She is the last in a fleet of nine ERRVs to be commissioned by Sentinel Marine since 2015.